Wearing all black is such an easy go-to for an effortlessly cool outfit. 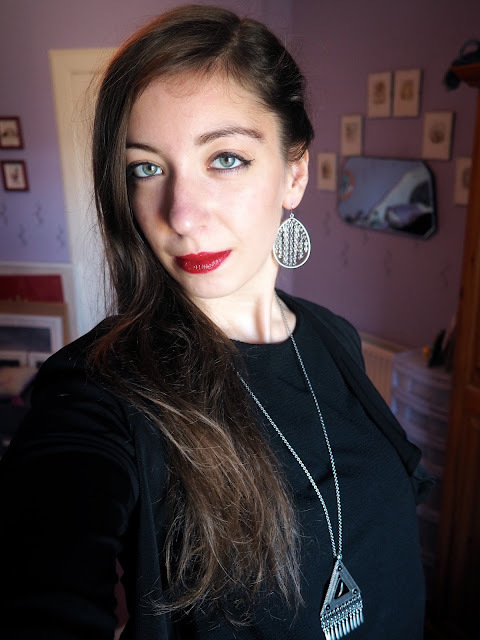 Each of these items is individually pretty simple, but combined with some statement jewellery items, and a classic red lip (pay no attention if my lipstick isn't perfect, I kind of did this in a hurry), it becomes a more dressed up outfit overall. This isn't quite a crop top, but it is a shorter cut than I normally wear, so I like it best with high or mid rise jeans like these. It's a little hard to tell, but it's actually a t-shirt and I'm wearing a little jacket over the top, since it's getting chilly back here in Scotland! The jeans are un-hemmed at he ankles too, so I like them paired with ankle boots like these, that show off that detail rather than hiding it, and I love the grey colour of these jeans, which makes them look a little smarter than blue jeans would. Also, thoughts on this hair? 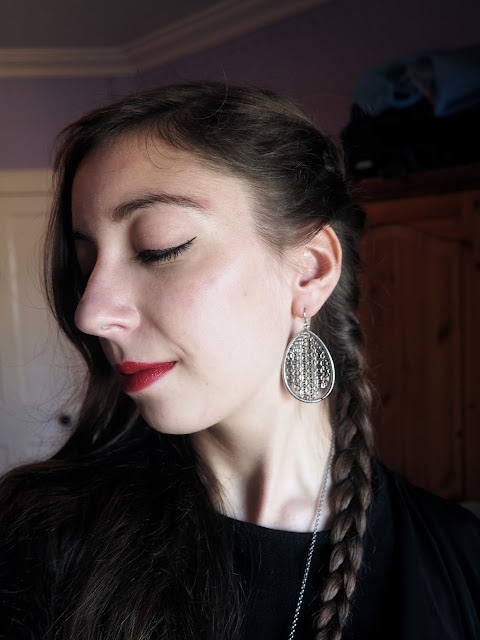 I was playing around with this side braid, just for a change (the other side still looks a mess though, oops! ), and am undecided if I'd wear it out like this?